The Mar Menor is a saltwater lagoon, the largest in Spain. In the summer it is know for its lovely warm waters making it a water-sports heaven. We had read about it being a popular place for expats to settle and, while that is not normally a good sign that we’ll like a place, we thought it was worth checking out. It’s a lesser know part of Spain and a little off the beaten track from the main spots in the Costa del Sol and Costa Blanca so worth a look. We decided to stop at Los Alcazares near the local airport. The frequency of military jets flying over head might bother some people, for us it just made us feel nostalgic for San Diego. The jets aside, Los Alcazares did not win us over. In the end we only stayed for one night. Admittedly it was off-season so lots of places were closed but the town center bars and restaurants that were open catered mostly to local Brits and a few other Northern Europeans who live here now. We don’t mind tourist towns or expat communities to visit sometimes and I don’t want to disparage places others have decided to call home but this one was not to our taste at all. Suffice to say we headed off to Cartagena the next day. We stayed at a fabulous location run by a very friendly and hospitable Dutch couple, John & Saskia. Sens Sleep may seem an unlikely stopover since you park on an old tennis court but it is exactly what you want from a place to stay. The hosts know what’s important because they are also motorhomers . They accommodate a maximum of eight motorhomes so it’s not too crowded and everyone gets a view which, by the way, is fantastic. Local vendors stop by most days with bread, meats, wine etc. The highlight of the week was a Sunday meal cooked by our hosts where all of the guests swapped their tales of travel around the table. Sunsets and hanging out with fellow travelers. Our spot was a 10 km cycle ride into Cartagena. It’s a bit of a steep ride (on the return journey) that necessitated a rest and a beer half way back up but it was worth it. We really liked the city of Cartagena, it’s natural port has made it a major naval center throughout the last few centuries and historic elegant buildings line pedestrian friendly streets. The historical sights are very impressive, in particular the Roman theater. It sits quite incredibly in the center of the city. It was built between 1 and 5 BC but unbelievably it was only discovered in 1988 after being buried for millennia under a market and later a cathedral. Our minds were boggled that a little over 30 years ago people were walking on top of this amazing place with no idea what treasures lay beneath their feet. All in all we spent a fantastic few nights in the Cartagena area. 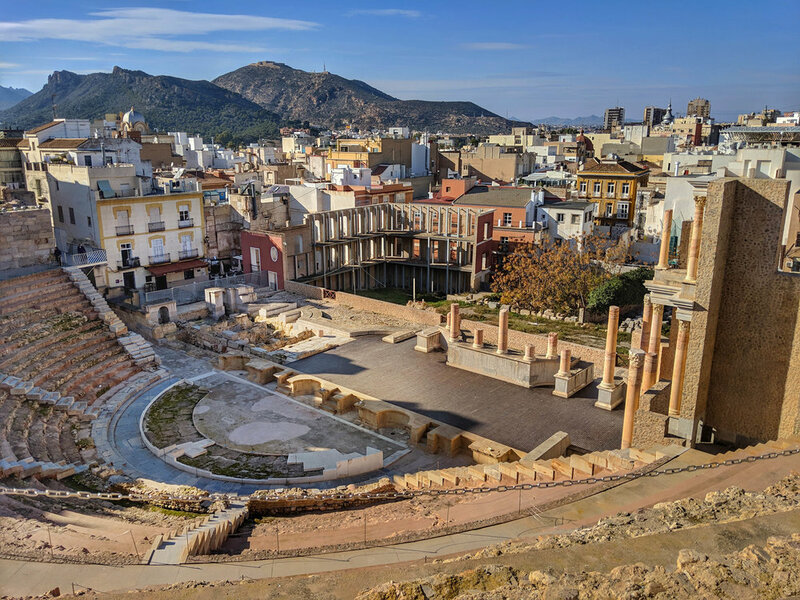 Given that we definitely want to explore more of the province of Murcia including the capital and the fact that we didn’t get to try all the marvelous offerings from local vendors, I have no doubt we will be back.